When Thomas O’Neill bequested funds to construct the Cathedral of Mary Our Queen church and school, his foresight provided thousands of young people with a premier Catholic education of which you, your children, grandchildren, and friends have benefitted. While we enjoy these benefits today, it is our responsibility to be good stewards of these programs and facilities to continue to provide opportunities for the next generation. Your gift—of any amount—makes this possible and ensures the lasting legacy and vision of a Cathedral School education and your students’ future success. Please make a gift today using our secure online giving form, or send a check made out to the School of the Cathedral. The Regina Plan, a program unique to The School of the Cathedral, is designed to assist students with mild to moderate language-based differences. 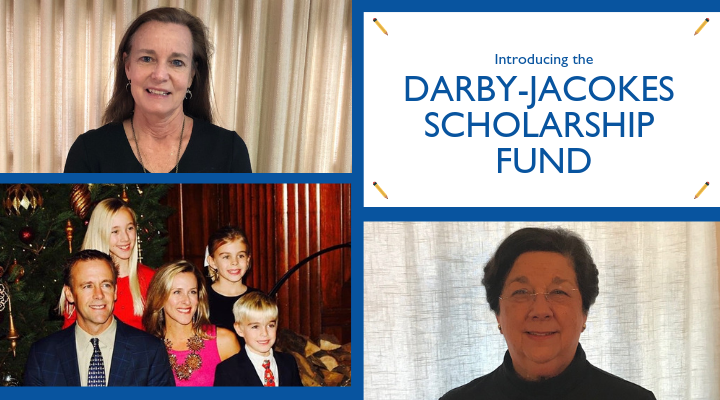 "The Darby-Jacokes Scholarship will enable more students to experience these benefits, which will serve them throughout their academic careers and beyond," says Dr. Lilly Hunter, of the scholarship fund she and her husband David established.